When introducing brain chemistry, many students will probably ask: what is a neurotransmitter? Explain that they are chemicals that are used to communicate in the brain and activate functions. Point out that deficits in neurotransmitters result in problems with normal brain function, like depression. They can be divided into two groups: small molecule neurotransmitters, like serotonin, and neuropeptide neurotransmitters, like corticotropin. Students can refer to the accompanying study guide for further help. Start the lesson by discussing Otto Loewi’s experiment, where he discovered neurotransmitters in 1921. Explain that Loewi used two hearts: one heart still had its vagus nerve and was in a saline solution. The two hearts were in a connected chamber, so the saline solution traveled over to the other heart. When the vagus nerve was stimulated, the first heart slowed down; but so did the second heart after some time had passed. This lead Loewi to realize that a chemical, what he called “Vagusstoff," was the cause of the reaction, not the nerve stimulation. Point out to students that “Vagusstoff" is now referred to as acetylcholine, a small molecule neurotransmitter. “If the chemical is applied on the post-synaptic membrane, it should have the same effect as when it is released by a neuron." Do an exercise with students: give students a list of neurotransmitters and ask them which criteria they fulfill. Review the answers as a group. 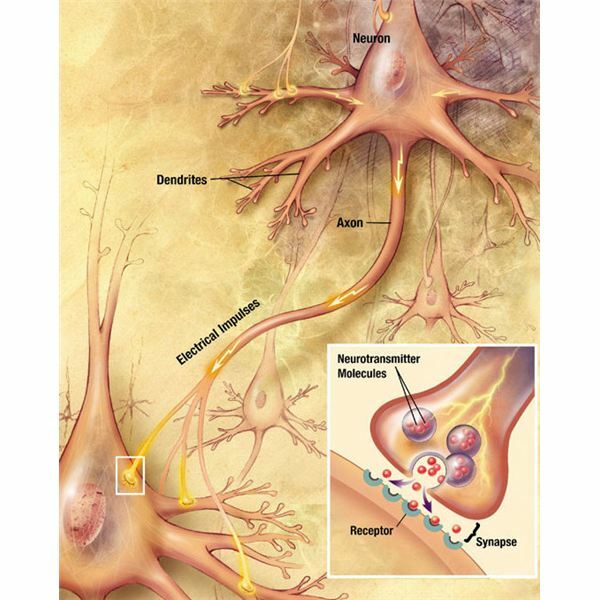 Explain that neurotransmitters go through a specific process: production, binding and inactivation. Start with production: the neurotransmitters are made in the cell body and stored in vesicles. Next, explain that the vesicles open up at the axon terminal membrane, so the neurotransmitter is released into the synaptic cleft. It then binds to its receptor and is used by the brain. Point out to students that the neurotransmitter can be inactivated in one of four ways: diffusion, enzymatic disintegration, glial cells and reuptake. Have the students review how neurotransmitters work by having them map out the “life" of each one, and specify which inactivation process is used.